Eric Revis Quartet – Live Stream! If you can’t attend in person, you can view the live stream at www.smallsjazzclub.com tonight! Show times are 6:30pm and 11:15pm EDT. Eric Revis has worked across a broad spectrum of jazz, from mainstream to free, from his emergence with Betty Carter in the ‘90s and tenure in the Branford Marsalis Quartet to recent collaborations with Peter Brötzmann and Ken Vandermark. While that kind of varied career testifies to competence and flexibility, there’s something far more compelling in Revis’ music: a sheer force of personality that demands outlet. Here he finds a kind of free-jazz middle ground in a trio with pianist Kris Davis and drummer Andrew Cyrille, playing together for the first time in a recording studio. Recording a first meeting isn’t that unusual, but it’s particularly difficult in the space in which this group operates. Seven of the ten pieces played here are completely improvised (complemented by a Revis original and tunes by Monk and Keith Jarrett), but they are done so with a special ear for pattern and intuitive structure. Revis’ bass playing is grounded: though he might take sudden flight into the upper register, he focuses on the low end, creating a solid foundation. The approach finds ideal partners in Davis and Cyrille, Revis’ equals in intensity and spontaneous structure. There’s a profound communication evident in trio music of genuinely equal parts. Working largely without composed structures reveals how fluent an improviser Davis is, playing with an exuberant virtuosity that invites comparison with Don Pullen and Marilyn Crispell. Cyrille, still the consummate free jazz drummer at 73, can generate sufficient force and form to suggest that the band itself is a kind of drum kit, a key to the empathy here in which every instrument sounds like the center of the band. While the music is always intense, there’s also variety, ranging from the creative flights of “Vadim” to the percussive insistence of “St. Cyr”. For a group that’s so accomplished in a dense, rhythmic dynamism, the trio also whispers very well on the minimalist “Egon” and title track. It’s a creative contrast that bodes well for the trio’s further development. For more information, visit cleanfeed-records.com. Revis is at Smalls Sep. 4th-5th as a leader. Jazz Standard Sep. 3rd with Tarbaby and 6th-8th with Orrin Evans. Simply one of the most versatile bassists in 21st-century jazz, Eric Revis has lent his muscular, impassioned playing to projects led by Branford Marsalis, Peter Brötzmann and Bill McHenry, as well as the collaborative band Tarbaby. Here at Smalls he grapples with the twinned horns of McHenry and altoist Darius Jones, with Chad Taylor behind the drums. Bassist Eric Revis is one of the busiest musicians in the world. As I write this (7/08/13), he’s on tour in Europe with both the Branford Marsalis Quartet and the Kurt Rosenwinkel New Quartet. He’s also a charter member of the Tarbaby trio with Orrin Evans and Nasheet Waits making him a charter member of the LIKEMIND Collective as well (Part 1 is here). “City of Asylum” (Clean Feed Records) share its name with a Community Arts Organization in Pittsburgh, PA (www.cityofasylumpittsburgh.org/). It’s Revis’s 4th CD as a leader and features drum master Andrew Cyrille (born 1939) and the impressive young pianist Kris Davis. The bassist brought the musicians together and they created the program on this CD. Composed of 7 group improvisations and one piece each from Thelonious Monk (“Gallop’s Gallop“), Keith Jarrett (“Prayer“), and Revis’s “Question“, the music is alive with interaction, possibilities, ideas and quite far from cliche. The bassist has a “large” tone that blends well with Mr. Cyrille’s fluid percussion. Ms. Davis is one of the stronger improvisers in modern music, her ability to move in and out of the flow of the music, her striking choice of chords and melodic phrases, her percussive attack, all keep the listener on the edge of his seat (physically and mentally). There is nothing “standard” about her approach (you can say the same about Messrs. Cyrille and Revis as well) so these pieces feel “alive”. There are tens of thousands of covers of Monk tunes but few with the animation that this Trio imbues the song with. Mr. Cyrille creates a wall of percussion while the bassist, more often than not, plays counterpoint. The give-and-take of the bass and drums in the opening moments of “For Bill” is a fine example of how both musicians set up the dialogue and lay the table for Ms. Davis. She reacts to as well as acts on what her partners are creating. This piece is so quiet, at times, one must lean into the speakers, yet Mr. Cyrille never relinquishes the beat – in fact, he sets the level of intensity for the others. This music is neither heartless nor humorless. Witness “Harry Partch Laments the Dying of the Moon…and Then Laughs” – with Ms. Davis creating a “motor-rhythm” and Mr. Cyrille pushing an prodding beneath, the bassist creates a mysterious sound as he bows throughout the track. Revis sets a furious pace on his unaccompanied opening to “Prayer” and, when the drummer enters, one can hear the musicians “conversing”. Ms. Davis plays with slowing down the piece, creating a solo that rises with the bass in pursuit. The lovely melody line the pianist creates on “Traylor“is reminiscent of Paul Simon’s “An American Tune” – the drummer frames the piano beautifully with his cymbals and sparse use of the snare drum while the bassist creates a melody that moves in tandem with the piano. “City of Asylum” is filled with with riches, a group conversation that is open and intimate. One can sense that as Kris Davis, Andrew Cyrille and Eric Revis continue to explore this collaboration, their interactions will become ever more expansive. This CD is excellent yet one must see them live to complete the connection between musician, music and listener. For more information, go to ericrevis.com or www.cleanfeed-records.com/disco2US.asp?intID=430. Vocalist JD Walter is no stranger to experimentation, to taking chances in pursuit of creativity. He has recorded with saxophonist Dave Liebman, his 2006 CD “2Bass, A Face and Some Skin” found him in a session with 2 bassists and a drummer, and has co-led the group Luvpark with pianistOrrin Evans. For the past 5 years, he’s been issuing CDs on his own JWALREC label, including live recordings from Portugal. “One Step Away” is his latest (ad)venture and he turned over the reins of the production to Evans and bassist Eric Revis. Their choice was to record “live” in the studio utilizing Tarbaby (Evans, Revis and drummer Nasheet Waits) and guitarist Marc Ducret (who will be featured along with saxophonist Oliver Lake in the upcoming Tarbaby Rogue Art recording “Fanon”). The result is a fascinating blend of free improvisation, handsome ballads, inspired “instant” arrangements and smart choices of cover material. Guitarist Marvin Sewell joins the band for the modern soul sounding of “If I Knew“, a smooth blend of r’n’b, the “Philly Soul” sound of Thom Bell, and jazz. Walter bounces atop the band, overdubbing voices on the chorus, and truly digging into the words. Several of the songs have an experimental edge, including the sensuous rhythmical treat that is “How To Die and Where To Fly.” Walter duets with himself with Revis providing a funky bass figure and Waits supplying a very strong groove. “Inward” is just Ducret’s electric guitar as accompaniment for the socially conscious lyric. Walter’s voice moves gracefully alongside the guitar, the articulated lyrics standing out as does the creative lines the guitarist supplies. The blues feel of “It’s Raining Today” is juxtaposed with an electronic drone and Evans’ dancing piano lines (only on the first verse) – the song has a fascinating bridge before returning to the feel and sounds of the first half of the piece. 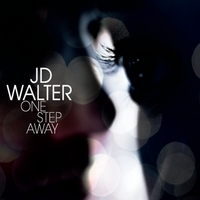 The sound of “One Step Away” is wonderfully open (save for the tune with the drone); all voices instrumental and human can be heard with Nasheet Waits’ drums right in the center of the mix and JD Walter usually on top of the band (the sole exception being “How To Die and Where To Fly” where the 2 voices are separated.) After several times through the program, what might sound “strange” first time through loses that definition and one realizes how well these sounds mesh together. JD Walter may have been challenged by the approach of his good friend and co-producer Orrin Evans but the results are exceptional. Dig in and dig it! For more information, go towww.jdwalter.com. The miraculous date that brought Review, Davis and Cyrille was thus described by the pianist: “Eric asked me if I would be interested in playing with Andrew; then, the album was a result of us coming together for the first time”. The testimony, sedutoramente entertaining, taken by Ethan Iverson – leader in Bad Plus, blogger at “Do The Math” and author of presentation notes -, conceals both the commitment and the discipline behind the session regarding the casulosas virtues of recording studios. AND refers vaguely to state of readiness as a survival strategy for life in a metropolis. WHICH brings us back to this title that alludes to the International Network of Cities of Refuge – NGOs, derived from the International Parliament of Writers that Rushdie, Banks and Soyinka founded in 1994, consecrated under writers persecuted. In september 2012, a trio with Orrin Evans and Nasheet Waits, Review contacted with this reality to participate in “Jazz Poetry Concert” of the association City of Asylum/Pittsburgh, headquartered in Pennsylvania. It is therefore appropriate that evokes here a prayer – ‘Islands’, originally a duet with Charlie Haden, in 1975 included in “Death and the Flower” – a pianist that State, ai educated by the devotees of the Church of Christ, Scientist, that goes by the name of Keith Jarrett. Moreover, in a certain way, “City of Asylum” celebrates the spirituality of cams, a version of ‘Gallop’s Gallop’, of a Monk under the protection of Single Koenigswarter – Koenigswarter, a theme dedicated to the ex-slave Bill Traylor, kind of Matisse without the Stein family who painted, octogenarian and unwelcoming, the streets of Montgomery in the years 40, or a lauda to Harry Partch, the more misaligned of composers north Americans. What emerges is at the same time tender, revoluto, martyred (Cita are Cyrus), redeemed and frankly memorable. Andrew Cyrille is a 72-year-old drummer who spent a decade stoking the fiery eruptions of avant-garde pianist Cecil Taylor; he was arguably Taylor’s most ingenuous and empathetic foil. Kris Davis is a 30-something pianist with a reputation for mixing Taylor’s virtuosity with the elliptical phrasing and harmonic sophistication of Andrew Hill and the epigrammic wit of Thelonious Monk. The 46-year-old bassist Eric Revis presciently thought he and this pair could excel at collective improvisation, and City of Asylum is the consistently marvelous result, tapping into a shared intuitive wellspring that spans generations. It is distinctively wise and fearless in all the right places. There are three covers — Monk’s obscure “Gallop’s Gallop,” Keith Jarrett’s “Prayer” and Revis’s own “Question” — but the nimble excitement and uncanny communication present in the seven improvisations are the real story on City of Asylum. “Vadim” is highlighted by the way Cyrille’s cymbals liquefy an otherwise-percussive song. “Egon” finds Revis in especially fine form, sawing and slapping his bow. On “Sot Avast,” Revis grinds out notes that recall thick ropes straining on a ship at sea before unearthing a low, growling riff topped off with a high-pitched accent, which Davis then eclipses with her own looming vamp. It is a forceful, unhesitating dynamically changeable song full of portent and beauty. The following improvisation, “For Bill Traylor,” is much different, an exercise in pace, patience and delicacy that is more resolute than gentle, with gorgeously rendered thickening and paring of the timbre. Revis, who released Parallax with Jason Moran, Ken Vandermark and Nasheet Waits late last year, now has two masterworks in six months time to his credit.